That’s the slogan of Wounded Warriors Family Support, an organization dedicated to providing aid to the families of veterans who have been wounded, injured or killed in combat. But when it comes to getting our veterans back into the workforce, Wounded Warriors doesn’t just limit itself to supporting wounded veterans. Army veteran Charles Carlin and Marine veteran Steve Coak with instructor Frank Hribar. The United Auto Workers (UAW), in partnership with Ford Motor Company and Wounded Warriors, currently offer a program to provide welding training to military veterans at the UAW-Ford Technical Training Center in Lincoln Park, Michigan, near Detroit. The program aims to help veterans help themselves by preparing them for a career in welding, an industry that’s in desperate need of precisely the kind of dedication, discipline and skill that military veterans can provide. The program emerged out of UAW-Ford’s dedication to showing appreciation and support to our nation’s veterans. Through their partnership with Wounded Warriors, the companies are able to offer assistance to veterans interested in welding training. Participants who live outside the Detroit area are eligible for room and board, and a need-based stipend is available to cover expenses at home while the veteran is attending class. 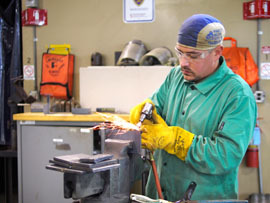 In last week’s blog post, U.S. Army veteran Ernesto Gomez spoke about his overwhelmingly positive experience as one of the welding program’s first participants. “Every day felt to me as if we were with family because of all the love and respect everyone at the training center, from the instructors to the office personnel and even the security guard, showed us. And we were all provided with a great lunch there at the facility. It was an incredible learning experience and not one veteran wanted the course to end,” Ernesto said. Successful participants are awarded a UAW-Ford Welding Course Certificate and are given the opportunity to take the AWS Certified Welder test in the 1G through 4G positions. Of course, since the ultimate goal is to have veterans find employment, a job coordinator is available to help get program graduates into the workforce. Several of the program’s graduates are working for Ford and others are working in fabrication shops. Still others have joined the Ironworkers union apprenticeship program. Needless to say, veterans interested in a rewarding career, should check out the opportunities and support available to them through the Veterans Welding Welding Program. It may be obvious, but it bears noting that women veterans should also consider taking advantage of the welding program. Women are a growing and particularly adept segment of the welding workforce. In fact, UAW-Ford Apprenticeship Coordinator, John McCollum, said that some of the program’s best students are women. For a recent participant’s thoughts about the Veterans Welding Training Program, check out From Warrior to Welder: One Veteran’s Path to a Career in Welding. For more information and to apply for the program, visit the Veterans Welding Training Program page on the Wounded Warriors Family Support website. You can also learn more about industry outreach to veterans, industry needs, and find digital resources for your welding career at American Welding Online. Finally, we at AWS send out a heartfelt thanks to our active and veteran service men and women. We invite those organizations in need of welders to consider the graduates of the Veterans Welding Training Program. Some organizations may even want to consider establishing their own veteran welding training program in order meet the employment needs of companies in their own communities. After all, even with the extra welding booths under construction to accommodate larger class sizes, UAW-Ford will not be able to do it alone. Rocky Di Iacovo, manager of the Veterans Welding Training Program at UAW-Ford, can help those organizations who are interested in hiring program graduates or establishing their own programs. Rocky has shepherded the welding program since its inception and looks forward to its replication in communities across the country. Let’s make it happen! Previous PostFrom Warrior to Welder: One Veteran’s Path to a Career in WeldingNext PostThe Future of the Military…in 3D! I am trying to go to school now for welding. Any help through this program would be awesome. I’m a veteran who needs work. 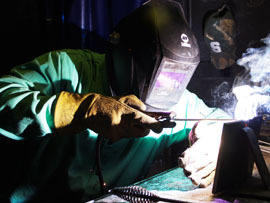 Please see our various blogs on welding programs for veterans.